Today we had the pleasure to help fulfill a wonderful client’s wish! De Jur Jones is a flight attendant/Yoga teacher, her hair has been long most of her life. She considers it as one of her best friends De Jur said she wanted to be more authentic to herself and decided to stop coloring her hair a year ago. To this day she has grown it out long enough to donate 12 inches to Locks of Love and is ready to move into her new look. 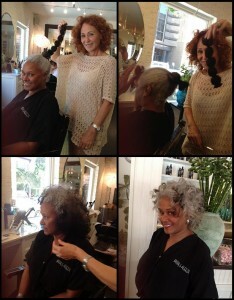 With the help of Batia, she has successfully reached the look she desired. Look at her brilliant, elegant hair. She truly looks like a shining star! Hope you love your hair as much as we do, De Jur. Hope to see you soon!! Call us to book your appointment! You wont be disappointed!